No one knows why, but they called a shedload of boats in the early 17th century The Mayflower. They were all over the place. Some sources claim there were as many as 37 Mayflowers cruising the oceans of the known world in the 1620s. And one of them got lucky. After a mundane life of herring, hats, hemp, salt hops and vinegar, it and its master, Christopher Jones, picked up its most famous cargo: 102 English pilgrims. This one, historians estimate, was launched in Harwich in Essex; a 100-foot long ship which could hold 180 casks of wine when push came to shove. The Mayflower was not a Godly boat, despite its passengers and their ideals. It was a jobbing boat, fit for purpose, manned by sea dogs who knew their trade and mocked the softies who had paid for their passage. The journey out was at the wrong time of year, the arrival rather desperate. The winter and a virulent disease killed off half the ship’s company as they lived on that freezing ship all winter, and by the Spring, the boat and its men were heart and body sick. So Master Jones must wait until his depleted crew were strong again. And on April 5, 1621, he set off back home, weighting the empty belly of the ship down with stones from Plymouth Harbour Shore. The Mayflower made excellent time, arriving back in England on May 6. But some say the journey took its toll on the ship and its captain. Jones died less than a year later and was buried at St Mary’s Church, Rotherhithe. And close by, The Mayflower sat berthed, a ship without a master. and 6 piks at ——– 50 s. A pitch pot and kettle for 13 shillings and four pence; and more besides. The whole lot totalled a little over £128. You can find original documents and an excellent summary here. Now: let us remember that there were many Mayflowers out there. For this is where supposition turns quickly to folklore. For the timber from one Mayflower, folks say the same Mayflower, was procured in Rotherhithe to build a barn in Buckinghamshire. And that barn is still there to this day. It stands in the ground of Jordans, the Quaker meeting-house and settlement where you can find the gravestone of William Penn, founder of Pennsylvania. For centuries it was used as a meeting place for the Quakers. It is just possible – taking into account where the timber was purchased, and the Penn connection, and the name of the barn, and the local tittle-tattle – that I was standing yards from the wood that bore these people to the Americas in 1619-20. Tourists from all over the world believe the folklore. They flocked to see the barn, made from the timbers of the ungodly ship with took pilgrims, some to a new life, some to their death. But the barn was sold into private hands in 2006, and it sits behind a gate away from the eyes of the public now. It did not stop me craning over the gate to gawp amiably and take photographs. Gleaming, well looked after wood it is, and grade II listed. Its structure inside is gorgeous hewn wood, a momentous meeting place indeed. The Quakers still hold their concerts there, though it is being transformed and refurbished in front of their very eyes. Sad not to be able to touch it, but still. It is The Mayflower Barn, after all. Posted in Quirks of History, UncategorizedTagged Buckinghamshire, history, Jordans, Mayflower barn, pilgrim fathers, USABookmark the permalink. Obviously, you need to invest in a small drone to get a closer look, perhaps Felix has a spare toy helicopter that could be enlisted into the service of your royalness. Oooh, what a great idea, Lou. Remote control snooping. I echo Lou’s suggestion. You need something to get you inside, invisible to prying eyes ~ like an invisibility cloak. Nice tale and beautiful barn. I thought all barns of that character had been gentrified or “Grand Designed” by now….amazing to see that this one has escaped. Being listed is not normally an obstacle to money. I think the fact the Quakers owned it has had a lot to do with that, Roger.They really are the most unaffected lot. Their graveyard is a sight to behold, and their meeting house built in 1688 looks like a 1940s utility build. ‘Less is more’ seems to be a way of life to them. I was quite taken, actually. Love this tale, Kate. We never hear about what happened to the Mayflower in history class. I always assumed the Pilgrims just kept it with them. Silly me. 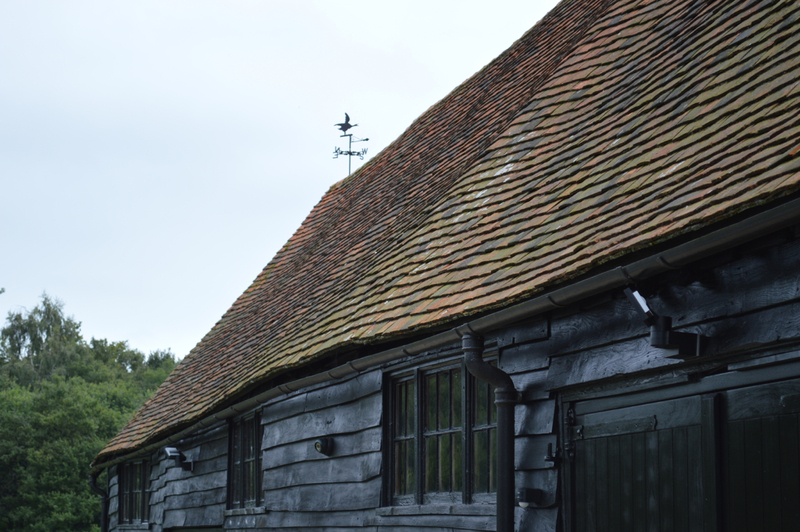 Whether the barn is a remnant of the Mayflower or no, it is a stunning structure. It had to come from something hardy. I have seen pictures of the inside, Andra, which is pretty well intact since its building as far as I can see. The Quakers never saw the need to change it, and I applaud that. I love being that close to history. It’s quite potent, isn’t it? Intoxicating. And addictive. So sensible to reuse all that wood. I am always amazed at the records of so much being kept for posterity. I know. It is make do and mend to the nth degree. How remarkable! Just to consider the possibilities is sometimes enough for me! I didn’t realize there were multiple Mayflowers! Interesting curiosity! It is. I just liked standing close to the history, Debra. Amazing, should it be the right one. Very cool. I don’t have any Mayflower ancestors, but did have some that came to Plymouth over the next couple years. Wow. I haven’t read much about the families who went out, Steven. Maybe I should. Bia, how incredibly kind of you! Thank you for reading so much, and for this award. Seems a pity that the actuality of the ship was not much in keeping with the pretty and romanticised name. This is quite an intriguing tale , Kate — and packed with history, myth and recycling! Oh, to be that close to history and not be able to touch it. But I do envy you’re getting that close and posting another great story.